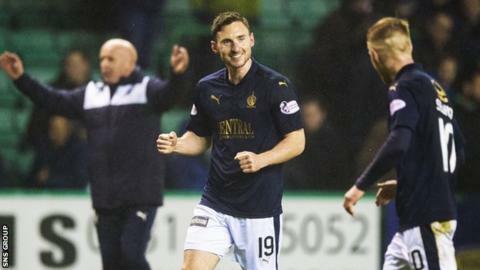 Manager Peter Houston praised Falkirk's "never-say-die attitude" following a remarkable comeback at Easter Road. With four minutes remaining, the Bairns were trailing 2-0 and had lost Aaron Muirhead to a red card. But headers from David McCracken and Bob McHugh rescued a point and preserved a six-point lead over Hibs in the Championship's race for second. "We showed great character to get a goal back and I think we deserved the equaliser," said Houston. "I've been a manager for quite a while. I don't sit back to just get beat 2-0. When we get a goal back, we stick an extra forward on. "I don't like getting beat and I'll always try to get something from a match." A defensive mix-up gifted Hibs an early lead and Jason Cummings got a second from the penalty spot after 81 minutes not long after Muirhead's dismissal for a second booking. "We gave them the first goal and then the referee gives them the softest penalty kick since the last one Hibs got against us," Houston told BBC Scotland. "Hibs were having a go at the referee and linesmen the whole game. First half, they were screaming for penalties at corners. "Then it so happens that the referee gives them a penalty from a corner." McCracken was culpable for both Hibs goals, but it was his header that got Falkirk back into the game, with the hosts jittery in defence. "All over the pitch, we had a go, especially in the second half," said Houston. "Remember what we are up against. Hibs have probably three times the budget we have and loads of players sitting in the stand. "I had four strikers on the bench because I had nobody else available. We are certainly punching above our weight." Falkirk have a trip to face fourth-placed Raith Rovers and a home game with Morton before the play-offs begin, while Hibs have a Scottish Cup semi-final with Dundee United at the weekend and face champions Rangers in the first of their four remaining league matches. The late collapse means Hibs have collected just five points from their last eight outings. Manager Alan Stubbs said: "It was certainly an improvement in terms of performance. "I should be talking about that and a good three points, but we switched off for both goals and gave Falkirk a way back into the game. "For the majority of the game, I was really pleased with what they were doing. But two long balls should be dealt with and we don't do it. "I'm disappointed for the players because they looked like they were back on it. "They put a lot of effort in and they have not been rewarded for that."